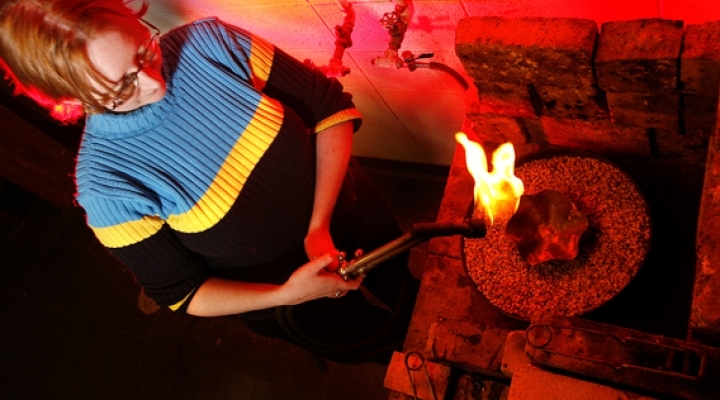 The BFA in Jewelry and Metals provides you with an in-depth knowledge of history of metalsmithing as well as "hands on" use of the equipment and techniques used in the craft. You will begin your course of study with ART 240: Jewelry and Metalsmithing I where you are introduced to the use of metal as an expressive media and techniques and tools associated with the art form including piercing, sawing, embossing, soldering, simple stone setting, and casting. various other historical and contemporary means of working with different media. Many of our program graduates have gone on to own businesses which are located in the central Kentucky area and offer our students the opportunity to learn from their experience. This, coupled with the visiting artist program which brings artist-metalsmiths to campus for lectures and workshops, provides a rich learning environment for our students. access to wood-working shop and computer lab for the application of CAD.